Chickens are simple creatures. Give them some room to roam, shelter from the rain, plus the occasional extra treat and they're as happy as Larry. With June being a washout and July forecast to not be much better, keeping your precious girls spirits up and their health tip-top, takes a little extra attention. This week's Blog looks at some of the best ways to keep your hens smiling through the rain and wind of this summer, because a happy hen is the best kind. The ground here at FSF HQ would best be described with a wonderful onomatopoeic word like "squidgy" or "squelchy". In fact it would only take a hoard of lost festival goers in wellies to turn the whole thing into a quagmire. When the ground is like this, dust-bathing becomes a real problem for hens. Hens clean themselves through dust-bathing, scratching a bowl into the earth, then ruffling the dust and fine earth through their feathers. With the ground sodden the way it is, this is an impossibility and it is now that the importance of having somewhere dry for your hens to bathe is really highlighted. 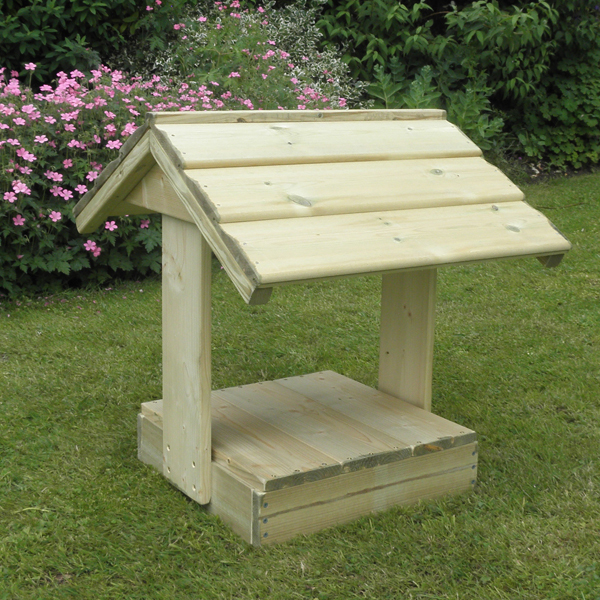 The Feeder Shelter / Dustbath provides a dry space to fill with sand or top soil to let your hens clean themselves. With its over-hanging roof, you don't have to worry about the inside getting wet either. If the weather ever clears up, the base is also reversible and becomes a handy covered place to put feeders and drinkers. Here in the office we all have our favourites when it comes to being our to turn to bring in biscuits. Personally I like a dark chocolate digestive. Nothing gets me through a long day like a biscuit. Occasionally our hens need a little cheering up too. Mixed Corn as an afternoon treat and supplement is ideal, but Boredom Buster Pecking Rings and Peck Blocks, can really help hens through long miserable days. They have the added advantage of preventing bad behaviour, brought about by boredom, like bullying and feather pecking. Healthy hens are happy hens and vice versa. There are poultry tonics and cider vinegars aplenty all ready to sit on the shelf and provide year round nutrients and vitamins for your poultry. A few that I would recommend in particular are the; Oreganico Tonic to boost your chickens immune systems and help to combat diseases, Life Guard Poultry Tonic for an all round natural tonic that will help and boost all areas of your chickens' immune system and health, and finally Hilton Herbs Cider Vinegar with Garlic, which aids the digestive system, bright eyes and shiny feathers. Any one of these tonics will provide your hen with a healthy boost during this dismal summer and healthy hens are happy hens. Making sure that your hens have food and water is obvious when it comes to keeping them happy, but what is more important is keeping their food and water clean and dry. 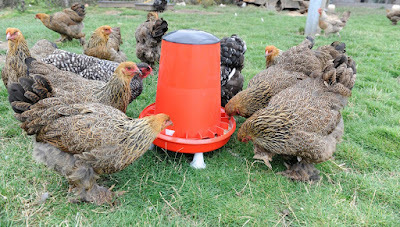 Feeders and Drinkers raised up on legs, helps prevent mud and detritus from being kicked into your hens food and water. Equally putting feeders somewhere sheltered will prevent feed being spoiled by rain. These few simple tips will help keep your hens happy whatever the weather, but if you have any questions why not leave a comment below or call us on 01300 345229 to speak to a member of our team.